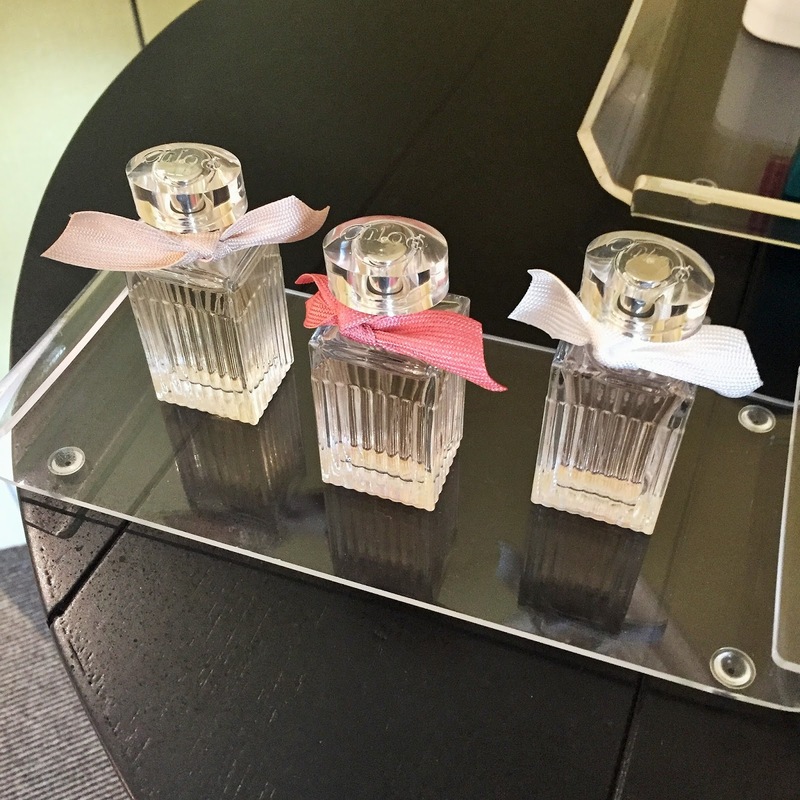 Last Thursday, I headed down to London for the Debenhams Beauty Press Day. It was a real treat. Any makeup lover would be over the moon to have the chance to nose around a ton of new spring/summer launches, and with all the brands that grace the beauty department of Debenhams, it's safe to say that there were treasures around every corner and that I ended up leaving with a wish list as long as my arm! The event was held at the stunning Haymarket Townhouse. 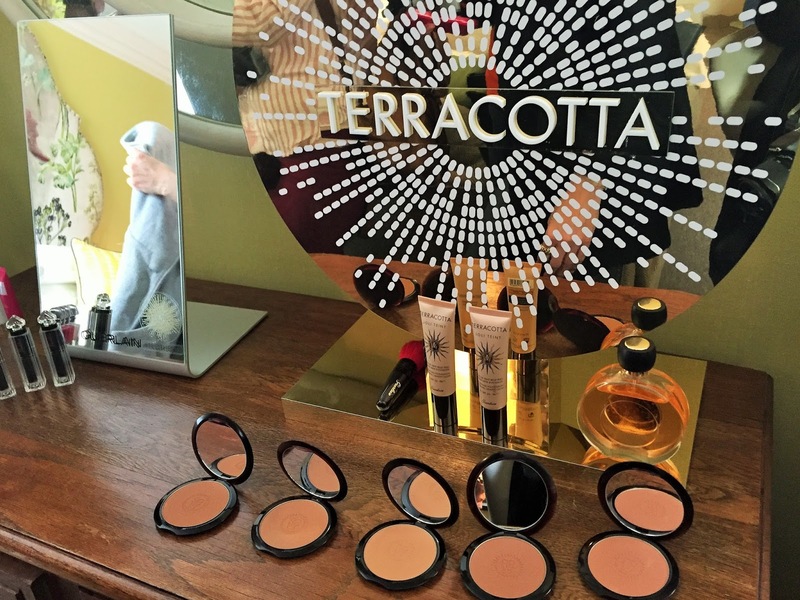 With beautiful products laid out in dream hotel rooms, the whole thing was a feast for the eyes and, quite frankly, an Instagrammer's paradise. I took hundreds of photos, so I thought I would just share a few with you to give you a flavour of the event. A gorgeous selection of Essie nail polishes cascaded across this table like sweets, looking good enough to eat. It was so much fun going from room to room, not only to explore all the pretty makeup, but also to admire the decor. How cool is this headboard? Especially if you like cats! The Too Faced Sweet Peach palette is pretty as a picture and really caught my eye. I particularly liked the lighter shades and don't really have anything similar in my collection. Another one for the list! 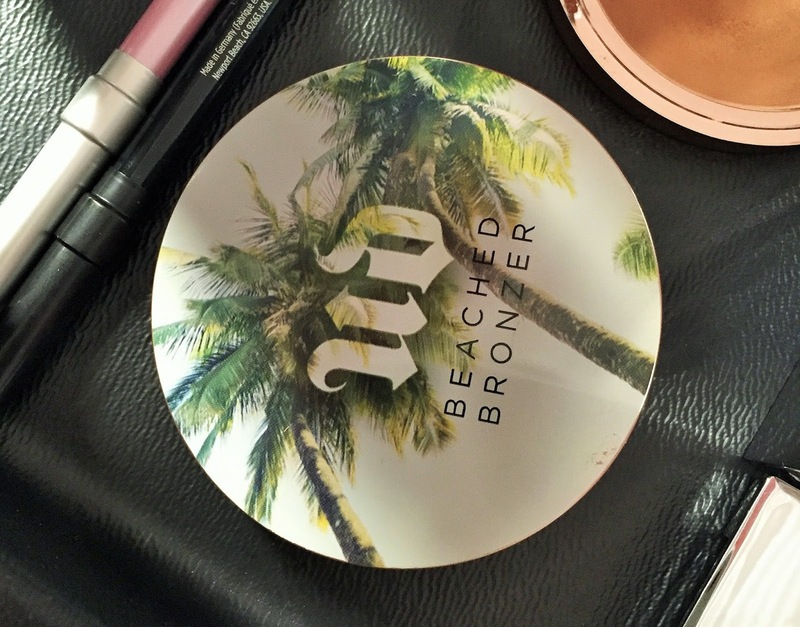 I also loved the Urban Decay Beached Bronzers and Afterglow Highlighters. 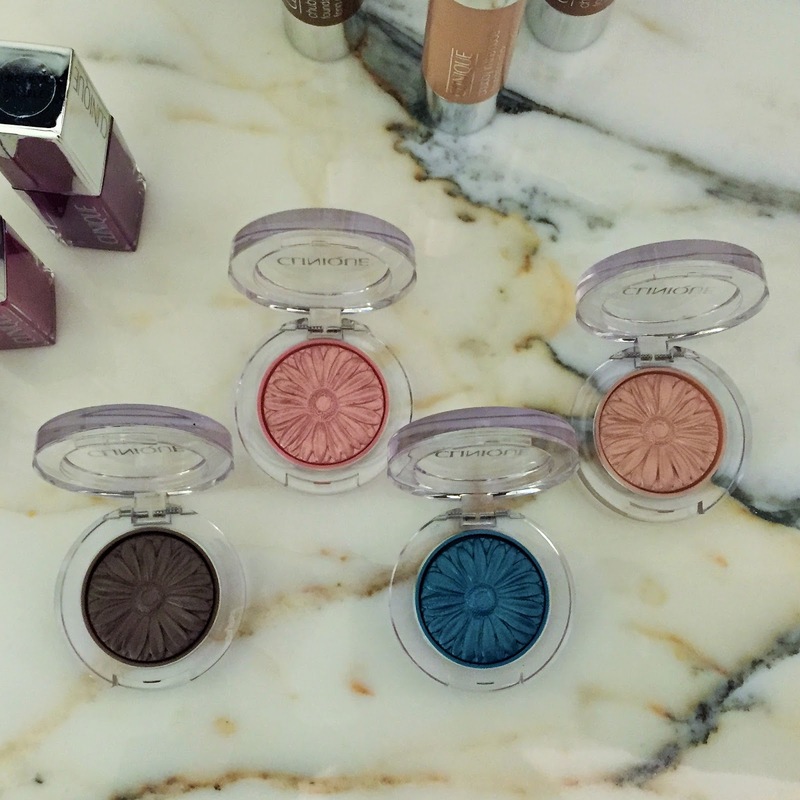 The shades and packaging are equally stunning. Besides luxe bedrooms and lounge areas, there were also bathrooms. 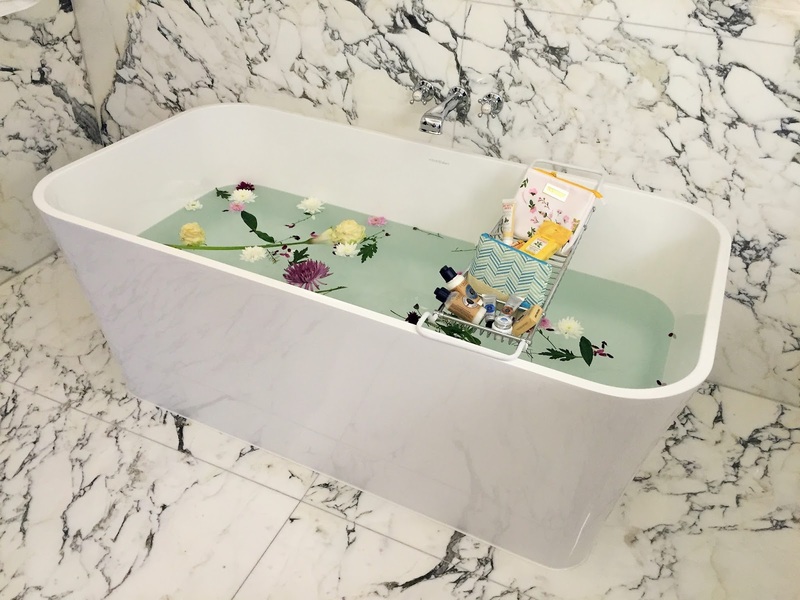 Stunning marble bathrooms, to be precise, with free standing tubs decorated with flowers. This one looked so inviting, but you'll be happy to know that I resisted the temptation to jump in. It wouldn't have been appropriate with all those people walking around, now would it? And the water would probably have been quite cold. On the side, a choice of perfumes to spritz on after your bath. I absolutely loved the Vince Camuto Capri fragrance, in the blue bottle at the front with the fancy silver lid. It's fresh, floral, light, conjures up images of yachts on blue oceans and is perfect for spring and summer. And isn't the packaging exquisite?! And of course there was more super pretty makeup to admire, this time from Illamasqua and Clinique. Now, what do you think happens when you put three bloggers in front of a mirror with a marble backdrop? Yep, that! A brilliant day was made even better when I bumped into Renata and Alina. Having like-minded people to coo over the makeup with and share a sandwich with afterwards really is the icing on the cake when it comes to events like this, and I had so much fun chatting and giggling with these two lovely ladies. Another bedroom, another fabulous headboard! And another marble bathroom, this time with some very lovely looking Estee Lauder products. 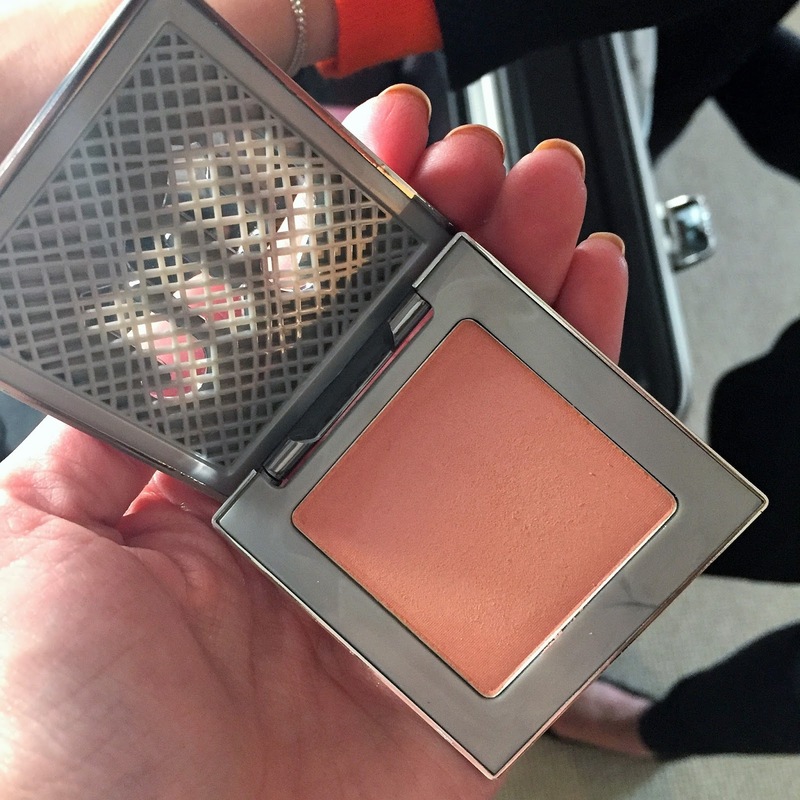 This is Pure Color Envy Sculpting Blush in Witty Peach. Isn't it a thing of beauty? It makes me think of summer sunsets. I think I need it. A mantelpiece full of YSL Touche Eclat foundations, recently re-formulated. I was colour matched for a sample of this and can't wait to give it a try. 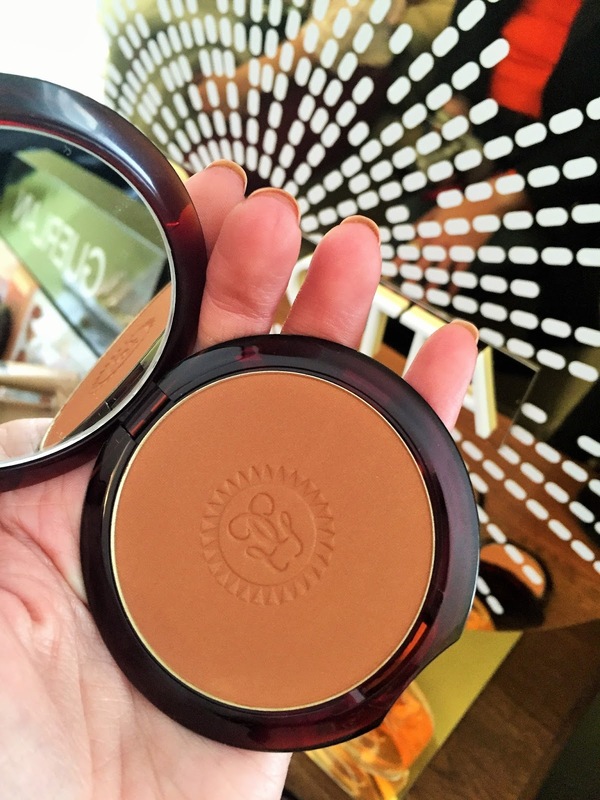 As for this Guerlain Terracotta Bronzer in 05... well, just look at it! I could go on and on. 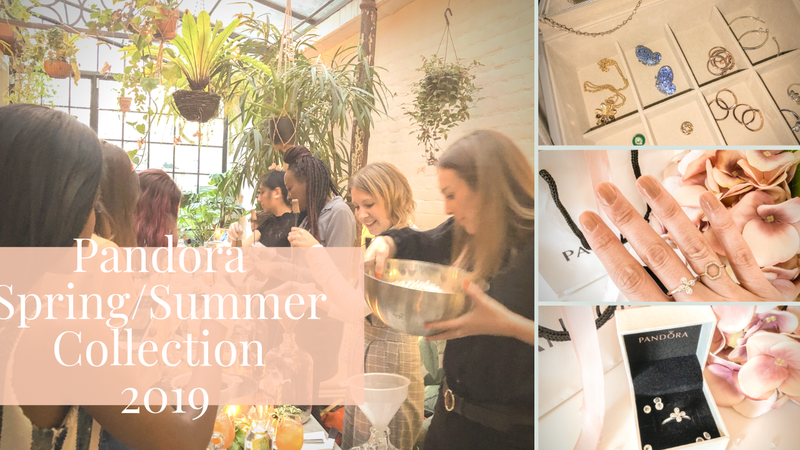 This was such a fabulous event, positively dripping with beautiful products, and I'm so grateful to Debenhams for inviting me. Meanwhile, the contents of the goodie bag should keep me going in blog posts for some time to come! So incredibly generous. Have you tried any of these products? And if not, which would you like to try the most? Now that looks like a lovely event. I would try one of each and then the bath tub, I guess. Love that picture of your three lovelies together! 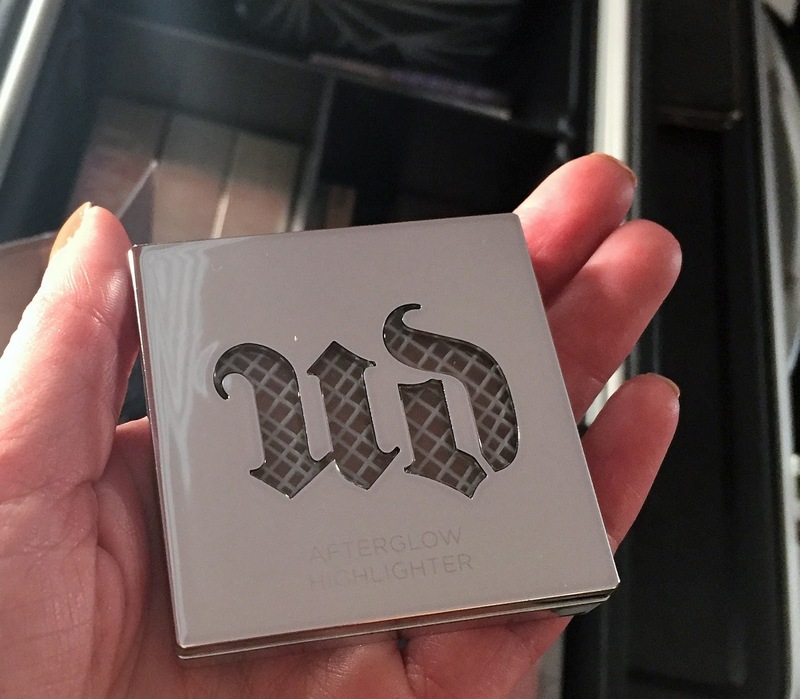 I am lusting after UD Afterglow highlighter, my hand is itching to click 'add to basket' at Sephora website. Thanks so much! The Essie polishes are gorgeous aren't they?! This sounds like such a fun event!! And I love that sunset blush too! What a great event! I love all of the decor in that hotel -- especially those headboards and those gorgeous bathtubs. 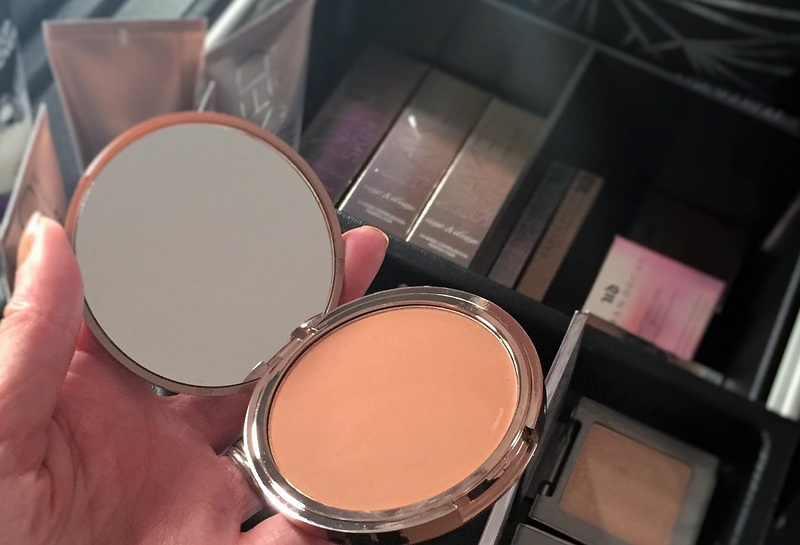 I can certainly see why you have a lot of beauty products on your wish list at the moment! This looks like such a fun event! 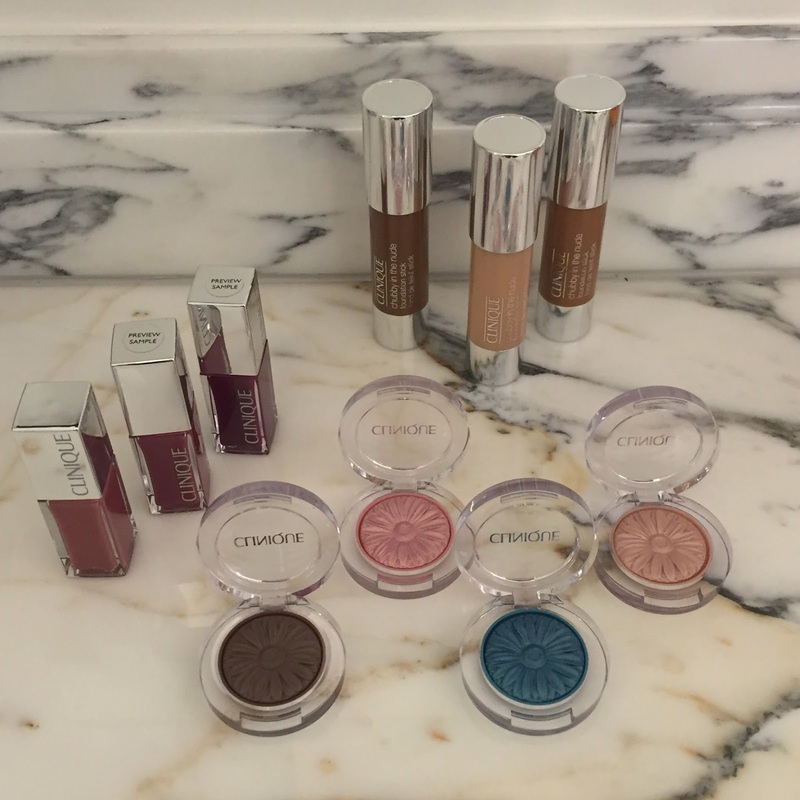 I'd totally go crazy for all of these products! Loving the colors of the nail polish!